Objective: To analyse the durability of the responses after haematopoietic stem cell transplantation (HSCT) for severe systemic sclerosis (SSc) and determine whether the high transplant related mortality (TRM) improved with experience. This EBMT/EULAR report describes the longer outcome of patients originally described in addition to newly recruited cases. Methods: Only patients with SSc, treated by HSCT in European phase I–II studies from 1996 up to 2002, with more than 6 months of follow up were included. Transplant regimens were according to the international consensus statements. Repeated evaluations analysed complete, partial, or non-response and the probability of disease progression and survival after HSCT (Kaplan-Meier). Results: Given as median (range). Among 57 patients aged 40 (9.1–68.7) years the skin scores improved at 6 (n = 37 patients), 12 (n = 30), 24 (n = 19), and 36 (n = 10) months after HSCT (p<0.005). After 22.9 (4.5–81.1) months, partial (n = 32) or complete response (n = 14) was seen in 92% and non-response in 8% (n = 4) of 50 observed cases. 35% of the patients with initial partial (n = 13/32) or complete response (n = 3/14) relapsed within 10 (2.2–48.7) months after HSCT. The TRM was 8.7% (n = 5/57). Deaths related to progression accounted for 14% (n = 8/57) of the 23% (n = 13/57) total mortality rate. 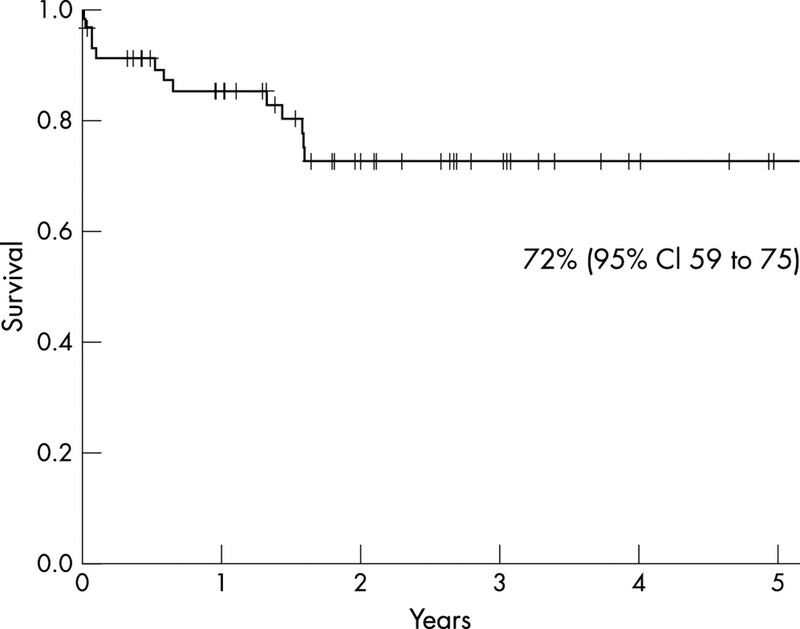 At 5 years, progression probability was 48% (95% CI 28 to 68) and the projected survival was 72% (95% CI 59 to 75). Conclusion: This EBMT/EULAR report showed that response in two thirds of the patients after HSCT was durable with an acceptable TRM. Based on these results prospective, randomised trials are proceeding. This follow up report from the EBMT/EULAR database describes the longer term outcome of those patients originally described in Binks paper36 with, in addition, newly recruited cases since then from all European phase I–II studies. The specific aims of this study were to evaluate the durability of the early positive responses and the possibility of reducing the TRM with better patient selection. We report results from patients with refractory severe SSc and early visceral involvement who were treated by autologous HSCT in several open, multicentre, uncontrolled phase I–II studies throughout Europe with at least 6 months’ follow up after transplantation and who were registered in the EBMT/EULAR International Stem Cell Project database up to August 2002. As previously published,36 participating centres were requested to follow the basic concepts and guidelines of the joint international committee of EULAR and EBMT25,28 for patients selection and protocol design. Patients with SSc, defined according to the American Rheumatism Association criteria,2 were eligible if they fulfilled at least one of the following characteristics: (a) early rapidly progressive diffuse SSc developing over the past 3 years despite continuing treatment and in the absence of end stage organ failure, or (b) limited SSc with life threatening pulmonary fibrosis or pulmonary hypertension. Patients written informed consent was required and each protocol was approved by local ethics committees. Pretransplant evaluation included (a) patient’s disease pattern (diffuse or limited skin sclerosis) and duration of the disease (in months since first diagnosis); (b) organ involvement to assess the severity of the disease according to (i) the extension of skin sclerosis using the Rodnan modified skin score40 with three local scoring system in addition to the Kahaleh score,41 (ii) electrocardiogram, echocardiography to measure left ventricular ejection fraction (LVEF, expressed as a percentage of normal), and mean pulmonary artery pressure (PAP in mm Hg), (iii) chest x ray examination, pulmonary function tests with vital capacity (VC) and carbon monoxide transfer factor (Tlco) expressed as a percentage of the predicted value to evaluate pulmonary function, (iv) creatinine clearance for renal function; (c) presence of anti Scl-70 (antitopoisomerase I) and anticentromere antibodies. Mobilisation and collection of PBSC was achieved with cyclophosphamide (4 g/m2) in combination with granulocyte-colony stimulating factor (G-CSF), or G-CSF alone according to local protocol or when cardiac function with decreased LVEF prevented the use of cyclophosphamide. Cell selection before transplantation was performed or not, according to local protocol, using CD34 positive selection with or without additional lymphocyte depletion using monoclonal antibodies, particularly anti-CD52 (CAMPATH 1), anti-CD3, anti-CD19, or anti-CD20. The conditioning regimen, as previously described,36 used various combinations of cyclophosphamide alone (at 150 or 200 mg/kg total dose) or with the addition of total body irradiation (TBI), total lymphoid irradiation (TLI), antithymocyte globulins (ATG), or CAMPATH 1 to achieve further T cell depletion, or another regimen (BEAM: carmustine, cytarabine, melphalan, and etoposide or fludarabine alone or carmustine (BCNU) alone. To assess the durability of the observed responses, repeated evaluation of skin score, pulmonary, cardiac, and renal functions by the local investigators were recorded at 6, 12, 24, and 36 months after transplantation. Results were given as a percentage of baseline values compared with those obtained at the time of the pretransplant evaluation as assessed at inclusion. A decline in skin score was considered significant if it differed by more than 25% from baseline values42 or by more than 10% of the maximum skin score.36 A 15% change in VC or in Tlco was considered to be clinically significant. At each evaluation, the patient outcome was classified by the local investigators according to results of clinical and laboratory examination according to the EBMT definition as follows: complete response if the overall response was above 50%, partial response if the overall response was above 25% and below 50%, stable disease with no response, or progression as compared with inclusion. Relapse was defined by the onset of progression after prior partial or complete response. Disease progression was defined as an increase in skin score above 25% compared with the baseline values, the onset of a decrease in VC or Tlco above 15% compared with baseline, and/or progressive vital organ failure. The cause of death was classified as disease progression or treatment related. The final TRM and other negative outcomes were calculated for the whole group of patients—that is, some of those previously reported in Binks paper36 and the newly recruited patients since then. Clinical and laboratory data were collected at 6-monthly intervals. Results are described using the median and range of respective values. Outcomes are reported as of August 2002. Values after the transplant were compared with values at inclusion using the Wilcoxon signed rank test with a p value of 0.01 for significance to adjust for multiple comparisons. Probabilities of survival and of disease progression were calculated using the Kaplan-Meier estimator.43 For survival, death after transplantation was considered as an event, and patients were followed up to the last follow up. For the probability of disease progression, clinical evidence of disease progression in any of the organ systems affected was considered as an event, patients dying of treatment related complications were censored at the time of death. From January 1996 to August 2002, 57 patients with severe SSc (table 1) treated by autologous peripheral (n = 55) stem cell or bone marrow (n = 2) transplantation with at least 6 months’ follow up were reported by 22 European centres from nine countries to the EBMT/EULAR Registry. This new cohort included 32 patients previously analysed with a shorter follow up in Binks’ paper36 and 25 patients enrolled thereafter between August 1999 and August 2002. The geographical distribution of the patients was as follows: France (n = 14), Germany (n = 13), Netherlands (n = 8), United Kingdom (n = 7), Italy (n = 7), Spain (n = 4), Switzerland (n = 2), Finland (n = 1), Belgium (n = 1). Their median age was 40 (9.1–68.7) years with a female predominance (10 male, 47 female). Fifty patients had diffuse SSc and among them 62% of the patients (n = 26/42) had a skin score >50% of maximum, 57% (n = 25/44) a VC <70%, 62% (n = 28/45) a Tlco <70% of body mass related mean, and 61% (n = 28/46) had anti-Scl-70 antibodies. Four patients had limited disease, one was associated with a CREST syndrome—with anti-Scl-70 antibodies present in two of the four patients and anticentromere antibodies in one of two patients. Table 2 shows the disease characteristics and the severity criteria according to organ involvement, as described by the contributing doctor at inclusion. In the whole cohort, 82% (n = 40/49) of the patients had pulmonary disease with either a forced VC <70% and/or a Tlco <70% of reference values, 31% (n = 10/32) had a PAP >30 mm Hg, and 19% (n = 4/21) had these three severity criteria at inclusion. Symptoms of Raynaud’s phenomenon were present in 83% (n = 45/54) of the patients and the LVEF was <45% at inclusion in one of the 42 patients for whom these data were available. None of the 19 patients with available data had a creatinine clearance below 70 ml/min. Table 3 shows the regimen used for priming, PBSC selection before reinjection, and conditioning. Mobilisation of stem cells was successful in all but one of the 56 patients who underwent this procedure. This patient subsequently received bone marrow transplantation using ATG in addition to cyclophosphamide at the time of conditioning to achieve further T cell depletion. The other bone marrow transplant recipient received standard conditioning with cyclophosphamide alone. Cell selection was performed in 87% (n = 48/55) of the cases, mostly using CD34+ selection alone (n = 38/55) or with the addition of another monoclonal antibody (n = 9/55) (table 3). Engraftment was successful in all cases. 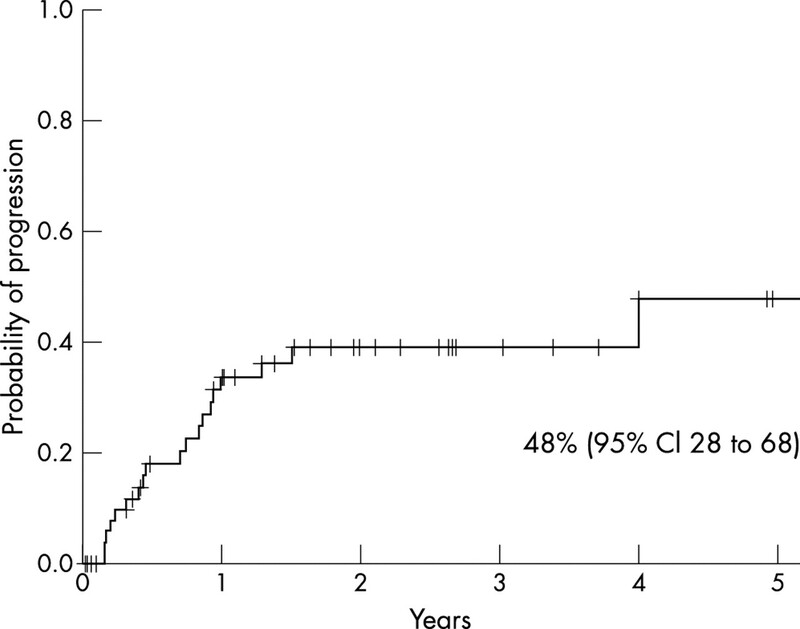 After a median follow up of 20 (range 0.6–81.1) months, 45 out of the 57 patients with severe SSc who had been enrolled in various phase I–II studies throughout Europe were alive with a projected 5 year survival of 72% (95% CI 59 to 75) (fig 4). In the whole cohort, the TRM was 8.7% (n = 5/57) and deaths related to disease progression accounted for 14% (n = 8/57) of the 23% (n = 13/57) total mortality rate observed in the cohort at the time of census. Among the 25 patients enrolled since the first report, two deaths were reported as “procedure related”, one in a patient with an LVEF below 40% and the other with a PAP of 33 mm Hg at inclusion (table 4). Evaluation of skin score in patients with severe systemic sclerosis before inclusion (n = 47) and then at 6 (n = 37), 12 (n = 30), 24 (n = 19), and 36 (n = 10) months after HSCT. The proportional change from baseline measurement was calculated for each patient at each available point using the Wilcoxon signed rank test, (p<0.001). Evaluation of vital capacity (VC) in patients with severe systemic sclerosis before inclusion (n = 47) and then at 6 (n = 26), 12 (n = 27), 24 (n = 18), and 36 (n = 10) months after HSCT. There was no significant deterioration for each patient when calculated at the available point compared with the baseline measurement using the Wilcoxon signed rank test (NS). Evaluation of Tlco in patients with severe SSc before inclusion (n = 47) and then at 6 (n = 25), 12 (n = 26), 24 (n = 18), and 36 (n = 10) months after HSCT. The proportional change from baseline measurement was calculated for each patient at each available point using the Wilcoxon signed rank test (NS). Cumulative probability of survival was 72+13% at 5 years according to Kaplan-Meier plot calculation. Skin scores were evaluated in 47 patients at inclusion with serial measurements from 6 to 36 months after HSCT. A significant fall in skin score, as defined in the “Patients and methods” section, was observed up to 24 and 36 months after HSCT, despite a slight increase at 36 compared with 24 months in two patients. Figure 1 illustrates the change in skin score from baseline for each case with at least 6 months’ follow up after HSCT. The median skin scores were significantly lower at 6 (n = 26/37 patients), 12 (n = 20/30 patients), 24 (n = 15/19 patients), and 36 (n = 6/10 patients) months than those measured at inclusion (p<0.005) (fig 1). Measurements of VC and Tlco were obtained at inclusion (n = 47 patients), with serial follow up available for the VC from 6 months (n = 26) up to 12 months (n = 26), 24 months (n = 18), and 36 months (n = 10) and for the Tlco from 6 months (n = 25) up to 12 months (n = 26 patients), 24 months (n = 18 patients), and 36 months (n = 10 patients) after HSCT. Overall, there was no significant change in the VC (fig 2) or in the Tlco (fig 3) throughout this follow up after HSCT. The LVEF was measured before transplantation in 42 patients with a median value of 60% (range 30–85%). Two patients in the whole cohort, who had been previously reported in Binks paper,36 would now be considered as having cardiac exclusion criteria. One patient had an LVEF <45% at inclusion. He died 8 days after the intensification procedure from septicaemia plus cardiac failure and death was reported as “procedure related”. The other one, with an initial PAP of 64 mm Hg, died from “disease progression” and pulmonary hypertension at 7 months after HSCT. No significant deterioration in renal function was reported throughout the follow up. The degree of disease response, as estimated by the local investigator, was reported in 48 patients with at least 6 months’ duration of follow up after PBSC transplantation. Among the two other patients who had received a bone marrow transplant, one patient showed complete remission for 1 year, followed by relapse and death from disease progression at 16.2 months of follow up. The other patient who had received a bone marrow transplant showed partial response until 33 months of follow up. Overall, among the 50 patients with at least 6 months follow up, a partial (n = 32) or a complete response (n = 14) was seen in 92% of the cases and non-response was observed in 8% (n = 4) within 22.9 (range 4.5–81.1) months after autologous HSCT. Longer follow up, showed that 35% of the initial patients with partial (n = 13/32) or complete response (n = 3/14) eventually relapsed within 9 months (range 2.2–48.7) after HSCT. Disease progression, leading to the addition of various immunosuppressive drugs according to local centres, was reported in 38% (n = 19/50) of the patients, of whom 42% (n = 8) subsequently died. The cumulative probability of disease progression at 5 years, calculated according to the Kaplan-Meier method, was 48% (95% CI 28 to 68) (fig 5). Cumulative probability of disease progression in 57 patients with severe SSc, as reported by local investigators, was estimated at 48+20% at 5 years according to the Kaplan-Meier method calculation. Disease progression was defined by an increase in skin score >25% compared with baseline values, the onset of a decrease in VC or in Tlco >15% compared with baseline, and/or progressive vital organ failure. HSCT was performed in five children (four female/one male) under the age of 18 years. Their median age at the time of HSCT was 12 years (range 9–17). All had lung disease at inclusion and SSc (four diffuse and one limited) had been diagnosed within 62 (range 26–85) months before HSCT. They all received the same mobilisation regimen using cyclophosphamide and G-CSF (n = 5) plus cell selection before transplantation with either CD34+ selection alone (n = 3) or CD34+/4+/8+ (n = 2). Different conditioning regimens were used: cyclophosphamide + antiCD52 (CAMPATH 1) (n = 3), cyclophosphamide + TBI + ATG (n = 1), or cyclophosphamide alone (n = 1). After a median duration of follow up of 37.5 (range 13.5–67.6) months, all the five children were alive. Four complete remissions, one partial remission, and one disease progression was observed. One relapse after initial complete remission occurred 9.2 months after transplant. Patient selection, therapeutic regimen, and graft manipulation were heterogeneous, because data were collected from 22 different European groups with various local practices. Although patients had been included in several small phase I–II trials,33,36 each local protocol was in accordance with the initial consensus guidelines published in 1996 for patient selection and therapeutic regimen.25,28 Therefore the whole cohort constituted a rather homogeneous group of patients, who had undergone autologous HSCT to assess the feasibility of the procedure, its toxicity, and clinical results and who were closely evaluated by each local investigator. All the patients, with either diffuse (n = 50) or limited (n = 4) disease had severe SSc, because the skin score was >50% maximum in 62% of cases, pulmonary involvement with forced VC and/or Tlco <70% was present in 82%, and pulmonary hypertension (PAP >30 mm Hg) in 31%. The therapeutic regimens were similar in most of the cases. For the mobilisation, the use of cyclophosphamide 4 g/m2+ G-CSF (84% of cases) was preferred over G-CSF alone (10.7%). This choice was irrespective of the risk for cyclophosphamide cardiotoxicity, because most of the patients mobilised by G-CSF alone had normal LVEF and a PAP <30 mm Hg at inclusion. Flares of autoimmune disease with the use of G-CSF alone have been reported in rheumatoid arthritis,50,51 multiple sclerosis,52,53 and in a few cases of systemic sclerosis.54,55 The use of cyclophosphamide based PBSC mobilisation protocol has therefore been encouraged, because the addition of a cyclophosphamide to G-CSF enhances the mobilisation efficacy, decreases the risk of flare, and may result in some clinical improvement after mobilisation alone.38,50–58 Cell selection before reinjection was performed in 87% of the cases, using mostly CD34+ selection alone or with another monoclonal antibody. For the conditioning, cyclophosphamide at 150–200 mg/kg total dose over 4 consecutive days (90% of cases) was used most commonly, either alone (n = 35 patients) or in combination with ATG (n = 12 patients). The aim of adding ATG to the conditioning regimen was to achieve further T cell depletion and more intense immunosuppression, but the small number of patients in each group did not allow us to analyse its efficacy in lowering the risk of sustained disease activity or in preventing the onset of relapse after longer follow up. In conclusion, this extended report, as part of a European collaborative effort, enabled us to gather all available data from phase I–II European clinical trials reported in the EBMT/EULAR registry. It confirmed that autologous HSCT is feasible, with low mortality in carefully selected patients,3,38 and allows impressive initial clinical responses which had not been previously obtained with any other therapeutic intervention in severe SSc. For the first time, it showed the durability of complete or partial remission observed in two thirds of the patients who had received a transplant up to 3 years after HSCT. The onset of relapse and the presence of sustained disease activity after longer follow up, which had already been reported in SSc38 and in other types of ADs treated by HSCT62 in 20–35% of the cases should not prevent the use of this promising therapeutic option in patients with severe SSc. Although some patients have evidence of disease activity after HSCT, they still do better than before, with a median skin score at 3 years still <25% of baseline values. Further studies will help to elucidate if the use of more intensive immunosuppression at the time of transplant, or maintenance of immunosuppressive drugs thereafter, such as mycophenolate mofetil,63 could lower this risk. The promising experience of these phase I and II studies has been exploited in the design of a phase III, prospective randomised controlled trial, ASTIS (Autologous Stem Cell Transplantation International Scleroderma) Trial (http//www.astistrial.com), which is currently running under the auspices of the EULAR and EBMT. Data reporting was to the EBMT/EULAR registry in Basel. The work was partly supported by the Horten Foundation, the Délégation Régionale à la Recherche Clinique Assistance Publique-Hôpitaux de Paris (PHRC 1997 AOM 97–030). We are also indebted to EBMT corporate members for their contribution. Furst D , Clements PJ. Hypothesis for the pathogenesis of SSc. J Rheumatol1997;24:53–7. Le Roy EC, Black CM, Fleischmajer R, Jablonska S, Krieg T, Medsger TA, et al. Scleroderma (systemic sclerosis): classification, subsets and pathogenesis. J Rheumatol1998;15:202–5. Wilson TJ, Van de Water J, Mohr FC, Boyd RL, Ansari A, Wick G, et al. Avian scleroderma: evidence for qualitative and quantitative T cell defects. J Autoimmun1992;5:261–76. Van Bekkum D . Short analytical review: new opportunities for the treatment of severe autoimmune diseases: bone marrow transplantation. Clin Immunol Immunopathol1998;89:1–10. Wells AU, Lorimer S, Majumdar S, Harrison NK, Corrin B, Black CM, et al. 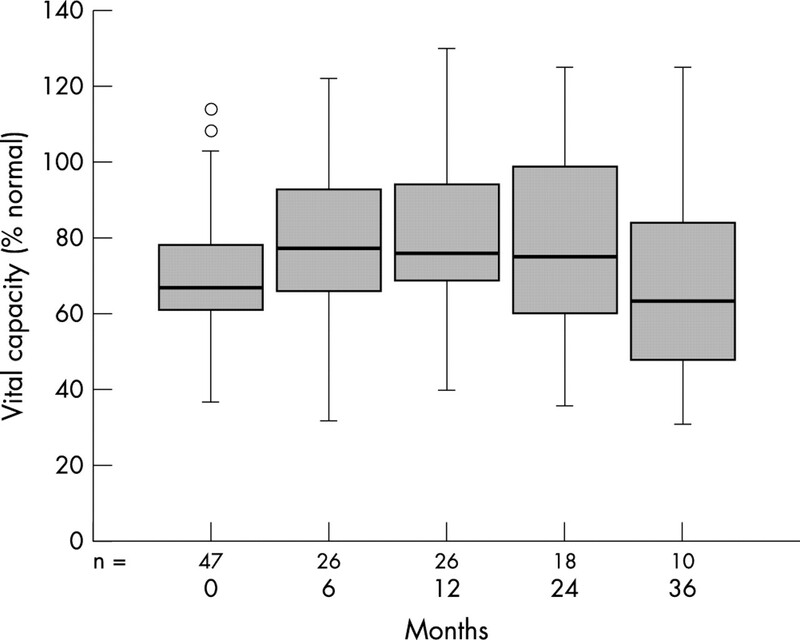 Fibrosing alveolitis in systemic sclerosis: increase in memory T-cells in lung interstitium. Eur Respir J1995;8:266–71. Yurovsky VV, Wigley FM, Wise RA, White B. Skewing of the CD8+ T-cell repertoire in the lungs of patients with systemic sclerosis. Hum Immunol1996;48:84–97. Denton CP, Xu S, Welsh KI, Pearson JD, Black CM. Scleroderma fibroblast phenotype is modulated by endothelial coculture. J Rheumatol1996;23:633–8. Sakkas Li , Xu B, Arlett CM, Lu S, Jimenez SA, Plastoucas CD. Oligoclonal T cell expansion in the skin of patients with systemic sclerosis. J Immunol2002;168:3649–59. Giordano M , Valentini G, Migliaresi S, Picillo U, Vatti M. Different antibody patterns and different prognoses in patients with various extent of skin sclerosis. J Rheumatol1986;13:911–16. Negi VS, Tripathy NK, Misra R, Nityanand S. Antiendothelial cell antibodies in scleroderma correlate with severe digital ischemia and pulmonary arterial hypertension. J Rheumatol1998;25:462–6. Altman RD, Medsger TA Jr, Bloch DA, Michel BA. Predictors of survival in systemic sclerosis (scleroderma). Arthritis Rheum1991;34:403–13. Bulpitt KJ, Clements PJ, Lachenbruch PA, Paulus HE, Peter JB, Agopian MS, et al. Early differentiated connective tissue disease: III. Outcome and prognostic indicators in early scleroderma (systemic sclerosis). Ann Intern Med1993;118:602–9. Bryan C , Knight C, Black M, Silman AJ. Prediction of five-year survival following presentation with scleroderma. Development of a simple model using three disease factors at first visit. Arthritis Rheum1999;42:2660–5. Ferri C , Valentini G, Cozzi F, Sebastiani, Michelassi C, La Montagna G, et al. Systemic sclerosis. Demographic, clinical, and serologic features and survival in 1012 Italian patients. Medicine (Baltimore)2002;81:139–53. Scussel-Lonzetti L , Joyal F, Raynauld JP, Roussin A, Rich E, Goulet JR, et al. Predicting mortality in systemic sclerosis. Analysis of cohort of 309 French Canadian patients with emphasis on features at diagnosis as predictive factors for survival. Medicine (Baltimore)2002;81:154–67. Steen VD, Medsger TA Jr. Severe organ involvement in systemic sclerosis with diffuse scleroderma. Arthritis Rheum2000;43:2437–44. Silver RM, Warrick JH, Kinsella MB, Staudt LS, Baumann MH, Strange C. Cyclophosphamide and low-dose prednisone therapy in patients with systemic sclerosis (scleroderma) with interstitial lung disease. J Rheumatol1993;20:838–44. Akesson A , Scheja A, Lundin A, Wollheim FA. Improved pulmonary function in systemic sclerosis after treatment with cyclophosphamide. Arthritis Rheum1994;37:729–35. Várai G , Earle L, Jimenez SA, Steiner RM, Varga J. 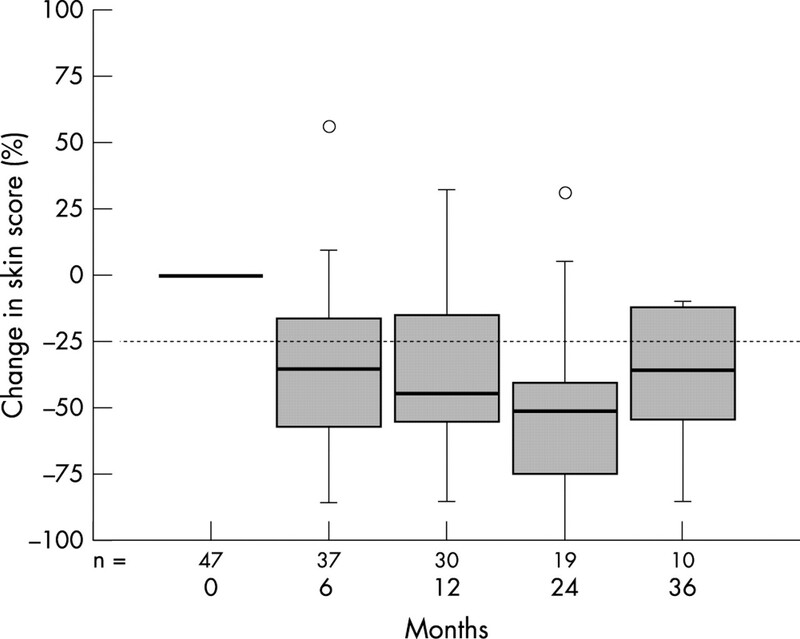 A pilot study of intermittent intravenous cylcophosphamide for the treatment of systemic sclerosis associated lung disease. J Rheumatol1998;25:1325–9. Davas EM, Peppas C, Maragou M, Alvanou E, Hondros D, Dantis PC. Intravenous cyclophosphamide pulse therapy for the treatment of lung disease associated with scleroderma. Clin Rheumatol1999;18:455–61. Griffiths B , Miles S, Moss H, Robertson R, Veale D, Emery P. Systemic sclerosis and interstitial lung disease: a pilot study using pulse intravenous methyprednisolone and cyclophosphamide to assess the effect on high resolution computed tomography scan and lung function. J Rheumatol2002;29:2371–8. Schnabel A , Reuter M, Gross WL. Intravenous pulse cyclophosphamide in the treatment of interstitial lung disease due to collagen vascular diseases. Arthritis Rheum1998;41:1215–20. White B , Moore WC, Wigley FM, Xiao HQ, Wise RA. Cyclophosphamide is associated with pulmonary function and survival benefit in patients with scleroderma and alveolitis. Ann Intern Med2000;132:947–54. Marmont AM. Immune ablation followed by allogeneic or autologous bone marrow transplantation: a new treatment for severe autoimmune diseases? Stem Cells1994;12:125–35. Marmont AM, Tyndall A, Gratwhol A, Vischer T. Hematopoietic precursor cell transplants for autoimmune diseases. Lancet1995;345:978. Van de Putte LBA, Tyndall A, Van den Hoogen FJH, Smolen JS. Hematopoietic stem cell transplants for autoimmune disease: role of EULAR. J Rheumatol1997;24:98–9. Tyndall A , Gratwohl A. Hematopoietic stem and progenitor cells in the treament of severe autoimmune diseases. Ann Rheum Dis1996;55:149–51. Tyndall A , Gratwohl A. Blood and marrow stem cell transplants in auto-immune disease: a consensus report written on behalf of the European League Against Rheumatism (EULAR) and the European Group for Blood and Marrow Transplantation (EBMT). Bone Marrow Transplant1997;19:643–5. Ikehara S , Good RA, Nakamura T, Sekita K, Inoue S, Oo MM, et al. Rationale for bone marrow transplantation in the treatment of autoimmune diseases. Proc Natl Acad Sci USA1985;82:2483–7. Marmont AM. New horizons in the treatment of autoimmune diseases: immunoablation and stem cell transplantation. Annu Rev Med2000;51:115–34. Good RA, Ikehara S. Preclinical investigations that subserve efforts to employ bone marrow transplantation for rheumatoid or autoimmune diseases. J Rheumatol1997;24:5–12. Marmont AM. Immunoablation followed or not by hematopoietic stem cells as an intense therapy for severe autoimmune diseases. New perspectives, new problems. Haematologica2001;86:337–45. Farge D , Gluckman E, Tyndall A. Treatment of severe autoimmune diseases by immunoablative chemotherapy and autologous bone marrow transplantation. Eur J Intern Med1999;10:88–96. Storb R . Hematopoietic stem cell transplantation in non malignant diseases. J Rheumatol1997;24:30–5. Jantunen E , Myllykangas-Luosujärvi R. Stem cell transplantation for treatment of severe autoimmune diseases: current status-future perspectives. Bone Marrow Transplant2000;25:351–6. Binks M , Passweg JR, Furst D, McSweeney P, Sullivan K, Besenthal C, et al. 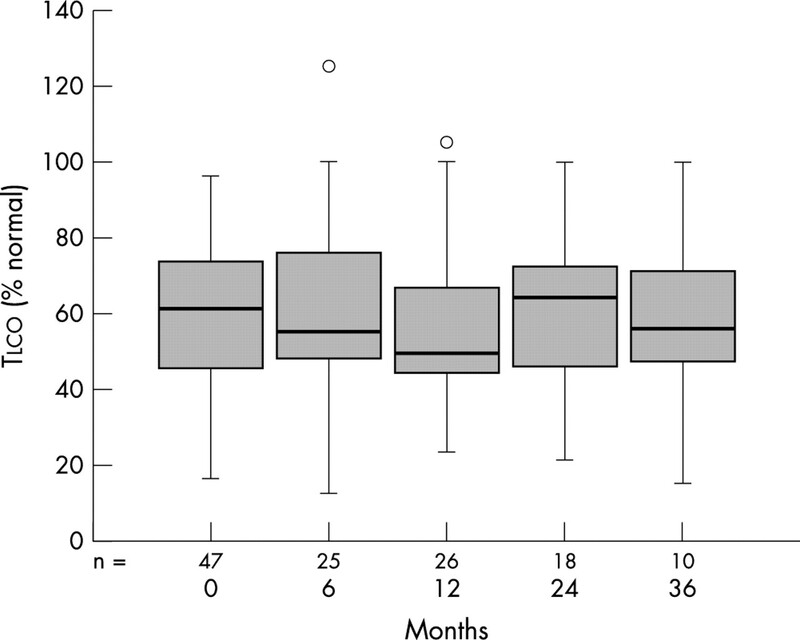 Phase I/II trial of autologous stem cell transplantation in systemic sclerosis: procedure related mortality and impact on skin disease. Ann Rheum Dis2001;60:577–84. McSweeney PA, Nash RA, Sullivan KM, Storek J, Crofford LJ, Dansey R, et al. High-dose immunosuppressive therapy for severe systemic sclerosis: initial outcomes. Blood2002;100:1602–10. Farge D , Marolleau JP, Zohar S, Marjanovic Z, Cabane J, Mounier N, for the Intensification et Autogreffe dans les Maladies Auto Immunes Résistantes (ISAMAIR) study group, et al. Autologous bone marrow transplantation in systemic sclerosis: early results from a multicenter phase I-II study. Br J Haematol2002;119:726–39. Tyndall A , Fassas A, Passweg J, Ruiz de Elvira C, Attal M, Brooks P, et al. Autologous haematopoietic stem cell transplants for autoimmune disease-feasibility and transplant-related mortality. Bone Marrow Transplant1999;24:729–34. Clements P , Lachenbruch P, Seibold JR, White B, Weiner S, Martin R, et al. Inter- and intraobserver variability of total skin thickness score (modified Rodan TSS) in systemic sclerosis. J Rheumatol1995;22:1281–5. Kahaleh MB, Sultany GL, Smith EA, Huffsutteter JE, Loaholt CB, Leroy C. A modified scleroderma skin scoring method. Clin Exp Rheumatol1986;4:367–9. Clements PJ, Hurtwitz EL, Wong WK, Seibold JR, Mayes M, White B, et al. High dose versus low dose D-penicillamine in early diffuse systemic sclerosis-analysis of a two year, double blind, randomised, controlled clinical trail. Arthritis Rheum2000;43:2445–54. Kaplan EL, Meier P. Nonparametric estimations from incomplete observations. J Am Stat Assoc2001;53:457–81. Tyndall A , Gratwohl A. Immune ablation and stem-cell therapy in autoimmune disease clinical experience. Arthritis Res2000;2:276–80. Tyndall A , Passweg J, Gratwohl A. Hematopoietic stem cell transplantation in the treatment of severe autoimmune diseases. Ann Rheum Dis2001;60:577–84. Waters TM, Bennett CL, Pajeau TS, Sobocinsky KA, Klein JP, Rowlings PA, et al. Economic analyses of bone marrow and blood stem cell transplantation for leukemias and lymphoma: what do we know? Bone Marrow Transplant1998;21:641–50. Laffel GL, Barnett AI, Finkelstein S, Kaye MP. The relation between experience and outcome in heart transplantation. N Engl J Med1992;327:1220–5. Denton CP, Cailes JB, Phillips GD, Wells AU, Black CM, Du Bois RM. Comparison of doppler echocardiography and right heart catheterization to assess pulmonary hypertension in systemic sclerosis. Br J Rheumatol1997;36:239–43. Naik MM, Diamond GA, Pai T, Soffer A, Siegel RJ. Correspondence of left ventricular ejection fraction determinations from two-dimensional echocardiography, radionuclide angiography and contrast cineangiography. J Am Coll Cardiol1995;25:937–42. Snowden JA, Biggs JC, Milliken ST, Fuller A, Staniforth D, Passuello F, et al. A randomised, blinded, placebo-controlled, dose escalation study of the tolerability and efficacy of filgrastim for haemopoietic stem cell mobilisation in patients with severe active rheumatoid arthritis. Bone Marrow Transplant1998;22:1035–41. Snowden JA, Biggs SC, Milliken ST, Fuller A, Brooks PM. A phase I-II escalation study of intensified cyclophophamide and autologous blood stem cell rescue in severe, active rheumatoid arthritis. Arthritis Rheum1999;42:2277–80. Openshaw H , Stuve O, Antel JP, Lundt BT, Weinet LP, Kashyap A. Multiple sclerosis flares associated with recombinant granulocyte colony-stimulating factor. Neurology2000;54:2147–50. Fassas A , Anagnostopoulos A, Kazis A, Kapinas K, Sakellari I, Kimiskidis V, et al. Peripheral blood stem cell transplantation in the treatment of progressive multiple sclerosis—first results from a pilot study. Bone Marrow Transplant1997;20:631–8. Burt RK, Traynor AE, Pope R, Schroeder J, Karlin KH, Lobeck L, et al. Treatment of autoimmune disease by intense immunosuppressive conditioning and autologous hematopoietic stem cell transplantation. Blood1998;92:3505–14. Burt RK, Fassas A, Snowden J, van Laar J, Kozak T, Wulffraat N, Collection of hematopoietic stem cells from patients with autoimmune diseases, et al.Bone Marrow Transplant2001;28:1–12. Burt RK, Slavin S, Burns H, Marmont A. Induction of tolerance in autoimmune diseases by hematopoietic stem cell transplantation: getting closer to a cure? Blood2002;99:768–84. Traynor AE, Schroeder J, Rosa RM, Cheng D, Stefka J, Mujais S, et al. Treatment of severe systemic lupus erythematosus with high-dose chemotherapy and haemopoietic stem-cell transplantation: a phase I study. Lancet2000;356:701–7. Verburg RJ, Kruize AA, van den Hoogen FH, Fibbe WE, Petersen EJ, Preijers F, et al. High dose chemotherapy and autologous hematopoietic stem cel transplantation in patients with rhumatoid arthritis: results of an open study to assess feasibility, safety and efficacy. Arthritis Rheum2001;44:754–60. Clements P , Lachenbruch PA, Seibold JR, Zee B, Steen VD, Brennan P, et al. Skin thickness score in systemic sclerosis: an assessment of interobserver variability in 3 independent studies. J Rheumatol1993;20:1892–6. Nagy Z , Czirjàk L. Predictors of survival in 171 patients with systemic sclerosis (scleroderma). Clin Rheumatol1997;16:454–60. Simeon CP, Armadans L, Fonollosa V, Vilardell M, Candell J, Tolosa C, et al. Survival prognostic factors and markers of morbidity in spanish patients with systemic sclerosis. Ann Rheum Dis1997;56:723–8. Euler HH, Marmont AM, Bacigalupo A, Fastenrath S, Dreger P, Hoffnecht M, et al. Early recurrence or persistence of autoimmune disease after unmanipulated autologous stem cell transplantation. Blood1996;88:3621–5. Straton RJ, Wilson H, Black CM. Pilot study of antithymocyte globulin plus mycophenolate mophetil in recent onset of diffuse scleroderma. Rheumatology (Oxford)2001;40:84–88.